Got out to Lester’s Square in the Marlborough Forest with my Brittany Hera and my buddy Jason Quinn with his German Wirehaired Pointer Nos on a fine Sunday morning, September 29th. We were on the road at 7:00 am as it is about an hour’s drive from Centretown Ottawa, where we live, to the hunting ground we chose for this outing. It was sunny and calm when we set out, a bit warmer than usual for this time of year, so we chose a cover that holds ponds and puddles in which the dogs could cool off. As we drove up to our desired spot, we discovered we had company. This is to be expected in public hunting grounds and we are happy to share the area with fellow hunters. I am acquainted with the group we saw and heard during the hunt. I have come across them in seasons past. They are hard to miss as you can hear them shouting at their dogs in Arabic and amongst themselves. We just made a point of keeping clear of them, so as not to interfere with their hunt, and to enjoy our own. No birds were flushed in our sweep of Lester’s Square, though the conditions in the woodcock cover are the best I have seen in the past few years. The bogs are nice and wet and the earth soft enough for the migrating woodcock to probe for the earthworms that make up their diet. I think we are just ahead of the migration. We will return to hunt the cover at Lester’s Square as often as we can through October in hopes of intercepting a few migrating woodcock. Hera and Nos run well together and Hera has really taken to hunting with great enthusiasm. She turns one year old in the first week of October and is coming along nicely in her training. We made our way to another patch of cover in the forest we call Paden. It is with some trepidation that we bring Nos there as a couple of years ago during a training run he attacked and killed a porcupine, suffering grievous injury in the process. I remember speeding back to Ottawa to the emergency veterinary clinic where Nos was sedated and in surgery for hours, having hundreds of quills removed from his face and mouth. We avoided the area where the attack took place and in the course of the hunt turned up one woodcock in a pocket of cover I expected to find birds. The woodcock was bumped by Nos and Jason dumped it cleanly with his new Beretta over and under. By then it was almost noon and the temperature had risen to 25 degrees C. The wind was picking up also, so we called it a day. Hera had a good morning afield, running and hunting hard. I cannot wait to get back in to the field with her. 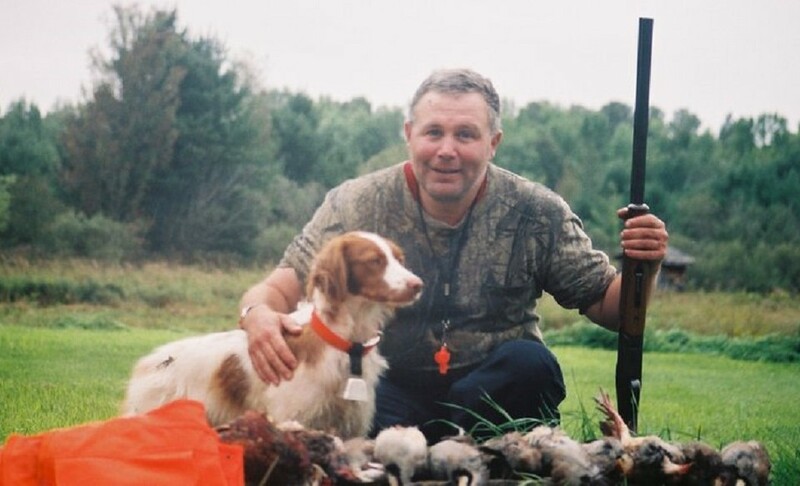 This entry was posted in Brittany (dog), Gun dogs, Hera, Hunting dogs, Pointing dogs, Ruffed grouse hunting, Small game hunting, Upland bird hunting, Woodcock hunting and tagged Beretta, Brittany (dog), Brittany Hera, Centretown Ottawa, coverts, game birds, German Wirehaired Pointer, German Wirehaired Pointer Nos, grouse, Gun dog, Hera, hunt, Hunting, Hunting dog, hunting season, hunting seasons, Ontario, outdoors, over and under, pointer, pointing dog, rabbit hunting, Ruffed grouse, shotgun, small game hunting, upland game, upland gunning, Veterinarian, Woodcock, woodcock hunting on September 30, 2013 by geoffreyandmika.